How to Backup Text Messages iPhone without iTunes? 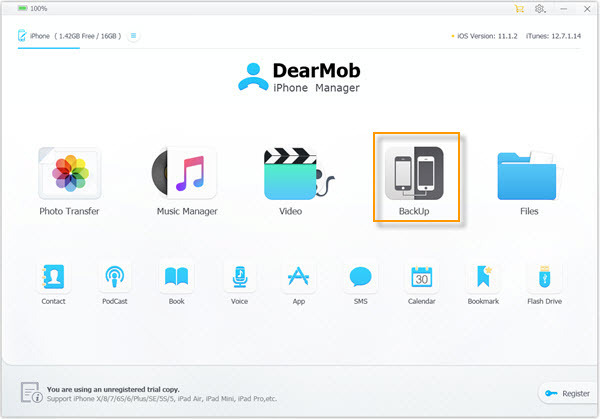 DearMob iPhone Manager is a one-stop iPhone backup software to zero-loss backup messages iPhone, and help users transfer text messages to new iPhone XS/XS Max/XR. The software supports encrypt iPhone text messages so that private SMS can be available to the owner only. It's easy to backup text messages iPhone with DearMob iPhone Manager, you're also able to encrypt iPhone backup to protect personal information. Guess you tried some existing tools already. However, since iTunes can only initiate a full iPhone backup instead of selective backup messages iPhone, does iCloud backup text messages? 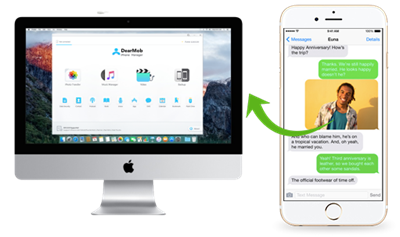 As a matter of fact, it's utmost easy to use the best SMS backup and restore tool – DearMob iPhone Manager – to backup iPhone text messages. You don't have to worry about losing animoji or emoji in iPhone messages the tool can complete a zero-loss backup of text messages iPhone iOS 12/11/10 or earlier. "I really need to have my iPhone return to factory to replace the broken iPhone screen glass. But how to backup text messages iPhone to that I can be safe with my personal messages, or even some sensitive sms that I don't want anyone else to see?" In fact you can backup iPhone messages to computer/mac and restore messages from backup with a simple mouse-click on DearMob iPhone Manager – as befitting a tool to backup and restore iPhone messages, this software can not only backup text messages iPhone, but also fully backup iPhone with encryption – why not just temporarily erase everything from iPhone for factory repair & restore iPhone from backup later so that you don't have to worry about data leakage in the slightest? Most importantly, you can get DearMob iPhone Manager to backup text messages iPhone & restore, all as easy as ABC. Now check out how to backup messages iPhone & restore SMS. First download DearMob iPhone Manager latest version for Windows and Mac, install & launch it. Step 1: USB-connect iPhone to computer with DearMob iPhone Manager, tap on “trust this computer” if this is the first time you cable-connect to backup messages iPhone. Step 2: On the “SMS” tab, click your mouse to visit the backup text messages iPhone UI, where you may start backing up iPhone messages. Step 3: When backup finishes, don’t forget to delete text messages on iPhone manually. Step 1: To get a complete backup of iPhone data, on the main panel click on "Backup", which takes you to the UI shown below to start not only backup text messages iPhone. Step 2: If you need to encrypt iPhone backup, check the "encrypt" box so as to password-protect iPhone data. Step 3: When backup finishes, don't forget to go to Settings > General Reset > Erase All Content and Settings. Step 1: First visit the iPhone backup location on Windows 10/Mac. 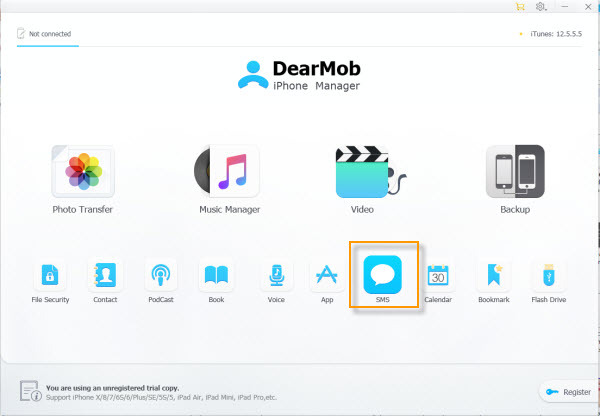 Step 2: Re-connect your iPhone anew with DearMob iPhone Manager, and visit the "Backup" tab again, locate to "Restore" to recover text messages iPhone XS/Xi/X Plus. Transfer Text Messages to New iPhone XS/Xi/X Plus 2019? Either when you've just purchased the brand-new iPhone model, or need to transfer text messages to new iPhone as a backup device while your iPhone is under repair in factory, this tool to backup text messages iPhone can backward transfer text messages to new iPhone powered with iOS 12/11/10 or earlier. Kindly be noted that text messages backup of higher version iOS can't be restored to lower version iOS devices. In order to transfer text messages to new iPhone 2019, you also need to first backup text messages iPhone to computer/Mac before they can be recovered to a new iPhone model. For how to backup text messages iPhone please refer to the steps above. Step 1: Connect the new iPhone to computer which you used for iPhone messages backup before, unlock iPhone with your password and tap on “trust this computer”/”trust this Mac” to help iPhone connect computer. 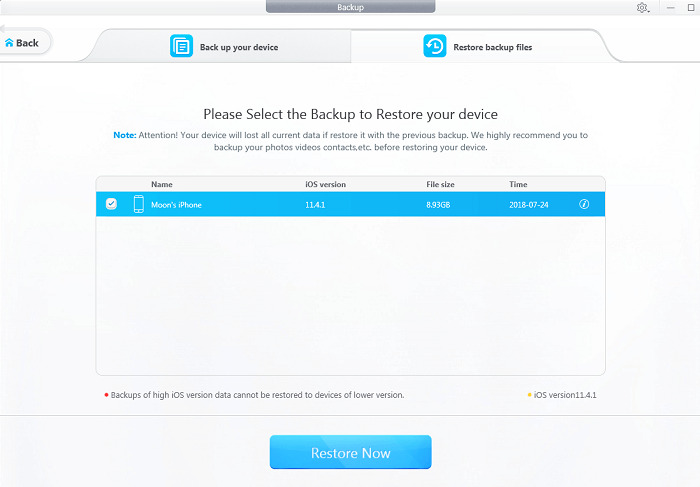 Step 2: Tap on the “Backup” icon, where you can switch to the restore iPhone data tab. Step 3: Choose a most relevant version that include the iPhone text messages you want to transfer to new iPhone, then hit on restore. If you ever protected the iPhone messages with password, type it to decrypt iPhone backup.